Jay Dee's CV is about as faultless as they come in hip-hop; part of A Tribe Called Quest's production team, he helped craft bona-fide hits for the likes of Busta, De La Soul and Pharcyde, before cementing an entire sound through his minimalistic beats for Common, Q-Tip and Slum Village in the late 90's. 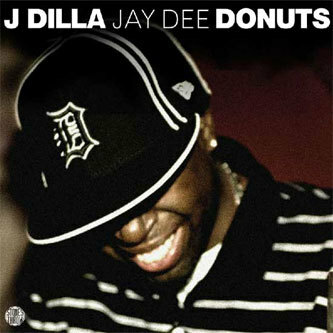 He then changed his name to J Dilla, formed a duo with Madlib (Jaylib), released a solo album 'Welcome to Detroit' and then constructed one of the most original hip-hop albums for years; without an MC in sight... Made up of brief sample-heavy vignettes, 'Donuts' origins as a production beat-tape are clear; but rather than flounder without lexical structure, the thirty-one pieces represent such a broad spectrum of sound and vision that any extra ingredients could well have destroyed its distinctive flavour. Alternating between bubbly electronica and hook-heavy soul, 'Donuts' is the antithesis of the beige and bullet-proof chic currently populating much mainstream hip-hop; with tracks like 'Two Can Win' and 'Da Factory' possessing more style, innovation and grace in two minutes than $1000's worth of 50 Cent. 10th Anniversary edition gatefold 2LP.